Ah! It's springtime in America and you know what that means...it's music festival time. I was pretty bummed when I found out a couple of months ago I would be unable to attend Edgefest 23 in Dallas. And that this year, Scott would get to have all the fun. But I held out hope I would be able to cover Pointfest 31 in St. Louis. As the time drew closer, those hopes faded. And then surprise, on the Friday before the show, MTC was approved for show coverage. Woohoo!! I quickly sent a text to Scott that simply read, "Can you hear me screaming in Dallas!!!" On to the show we go. This was the 31st installment of this annual, sometimes bi-annual, festival that traditionally features heavier acts such as previous performances by: Red Hot Chili Peppers, Wolfmother, 311, and Faith No More, just to name a few. 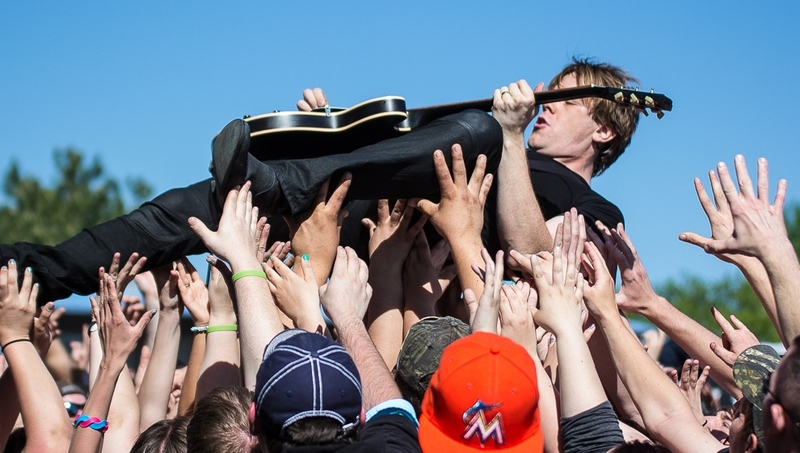 Pointfest 31 brought 21 bands to three stages in eleven hours; that folks, is a ton of music. The day started a little later than I anticipated. This was my first visit to Pointfest and I was a little taken back by the long lines of attendees waiting to get the once over by security. But being the quick thinker I am, I asked security if there was a separate press entrance and low and behold there was. Goodbye long lines, hello photographers' pit. Although my hasty entrance made for some early afternoon drama. In my rush to my gear out and begin shooting P.O.D. I inadvertently threw away my pass to shoot Alice In Chains. Not good. Again, a little quick thinking would save the day. Ms. Paramedic, may I borrow a pair of latex gloves, I'm going dumpster diving for my pass? After a minimal amount of trash moving, I found my pass. Now I can finally concentrate on what I came to do, enjoy the day and bring home a good story for MTC. Up front I will say there literally was not one really poor performance the entire day, maybe some that were lackluster, but all in all great to good performances by all bands. My main focuses of the day were the two side stages and the main stage after 6pm. Both side stages were filled with great talent. I was hoping to catch Bloodnstuff and Stardog Champion but arriving a bit late, I missed them. I did get to see all of P.O.D. 's set and it was a good one. The only thing that detracted from their time on stage was a rough start with microphones. Lead singer Sonny Sandoval went through four microphones before he found one that worked properly. Sandoval did make up for the technical troubles by doing two stage dives into the delighted masses. Next up, a band I have been wanting to see since I saw the bands namesake, and founder, Lzzy Hale's duet with Drowning Pool's front man on the Golden God awards a few weeks back. No complaints here. Ms. Hale and company brought a hard as nails edge to this beautiful St. Louis afternoon. Lzzy has a voice that is completely her own, somewhere between Janis Joplin and Pat Benatar. The side by side set up of the side stages made it easy to navigate between the two stages and easy to cover the next band, Sick Puppies. I knew one song by Sick Puppies, their hit "Maybe", and that's it. I didn't know they were from Australia or that they have been at this since 1997. Nor did I know they would be my second favorite performance of the afternoon. Frontman Shimon Moore took a queue from P.O.D. and entered the Pointfest masses twice as well. Sick Puppies chose to cover the Foo Fighter's "All My Life", which brought out the crowd surfers and set the bar high for the afternoons remaining acts. Hollywood Undead was another relative unknown for me except their humorous song, "Everywhere I Go". Man, was I in for a in for an introduction to this band. Hollywood amped up the bass and brought the noise for the Pointfest faithful. The crowd surfers amped up their journeys to the front of the stage as well, so much so my time in the pit was cut short as it became unsafe due to the amount of bodies coming over the barricade. The Hollywood bass was almost disorienting at the front of the stage and vibrated every bone in your body if you were within a hundred yard radius. Volbeat would round out this crazy afternoon at the side stages Volbeat was another band that I have wanted to cover since my introduction to their music some four years ago. This band hit the stage with a set that seemingly had everyone in attendance bouncing to their heavy duty rock-a-billy sound, complete with a cover of Johnny Cash's "Sad Man's Tongue". The energy that Volbeat provided made them my favorite performer on the side stages. Now on to the main stage. Bullet For My Valentine got things started on the main stage but their performance was less than stellar and felt as if they were rock stars going through the motions. Alright, let's see if Papa Roach can liven up the main stage. And having seen Papa Roach before, I already know the answer. Papa Roach worked their way in to my heart a few years back at Cruefest. Not the biggest fan of their music previously, my opinion was changed once I heard them live. Lead singer Jacoby Shaddix is a complete mad man on stage and is the true definition of what a rock and roll frontman should be. Jacoby, as usual, left the stage to wade through the 20,000 or so that were in attendance. If you ever have the opportunity to see Papa Roach live, do it, you won't be disappointed. As I would find out, the massive lines of Pointfest would take their toll on me once again as I missed Three Days Grace while waiting for over an hour for a refill of my soda. I did receive a couple word of mouth reports that Three Days Grace's performance was not up to par. OK, I feel better now.